There is a vast difference historically and otherwise between Kandy Lake and Colombos Lake Beira. Kandy is a dream city, partly in the way it nestles at the foot of green hills, charmingly making room for a lake as well, with glimpses of bungalows screened by thickly leafed trees perched on the hills. Kandy was for the first time adopted as a capital in the year 1592 AD, by King Wimaladharmasuriya, the one hundred and sixty fourth monarch to have reigned in Sri Lanka since 543 BC. He was going from place to place in search of a secure site for his capital. His people reported that a Kiri-mugatiya (the king of mongooses) was frequenting the vanatha (threshing ground) of Hingula-wela, now the Kandy Lake, and that it would be the ideal site for the capital. Kandy was chosen as a Royal City because of its strategic position, and as a religious centre because it was the Royal City. Drowsy, frangrant with flowers, and a gem of rare splendour set amidst the picturesque hills, Kandy sleep dreamily, reflecting her delicate beauty in the still waters of her limpid lake. The Kandy Lake took its form before Major Adam Davy attempted to capture Kandy. According to R. L. Brohier, the king is supposed to have first built a dam across the paddy fields, starting from the Pattiruppuwa (Octogen) side, where today one can see steps leading into the lake by the Mahamaluwa (Esplanade) and stretching across to the Poya-maluwa. Along the bund of the dam there was a roadway for the king to go across to the Malwatte Temple. The lake thus formed was called Kirimuhuda. When the king found the lake very beautiful, he then extended the dam to the present bund, removing the earth on both sides of the previous bund. According to DOyley, the dam was constructed between 1810-1812 AD, and the centre of the island the Jayatilleke Mandapayawas built supposedly where the king sent his queens for rest and recuperation. This lovely artificial lake built by the last king of Kandy, Sri Wickreme Rajasinha was completed in 1812. It was only three years after on 2nd March, 1815, that the British took possession of Kandy. The once beautiful expansion of water is today struggling against the throttling silt fast gathering around the lake. Towards Ampitiya the accumulated earth and sand has stabilised itself into a few acres of luxuriant grazing land, adjoining the playing fields that were also once part of the lake. Storm water has brought down tons of eroded soil from the building sites and factories into the lake. The silt traps have proved to be utterly ineffective against the massive down-flow of silt. The lake bund, too, has consequently become shoddy and ill-kept and totally neglected. The Beira Lake could have become one of the more pleasing sites of the city of Colombo, but is now neglected. As the population increased it became a public menace. Much of the sewage of the city found its way into the lake. Efforts were made to dredge the lake but this by itself could not cure the unhealthy and obnoxious conditions in the midst of the city of a wide stretch of polluted and stagnant waters. Proposals were made from time to time to connect the lake with the harbour by means of a canal and a lock or locks. Closely allied with them was a scheme for draining the lake or cutting canals though it to the various stores and the proposed lock. In 1904, the governor appointed a committee composed of the Director of Public Works F. A. Cooper, the Principal Collector of Customs W. K. Jackson, the Chairman of the Colombo Municipal Council E. M. de Courcy Short, and a Member of the Mercantile Community J. Wardrop to report on the proposals on how to connect the lake to the harbour. The committee reported on the 8th of November, 1905, that, owing to the depth of the lake, the construction of a canal from the harbour to the lake would by itself be of little practical advantage. The construction of such a canal, therefore, resuscitated the canalisation of the lake or extended dredging over the whole area. Some European firms had said that their interests would be adversely affected, but the majority welcomed the scheme which was carried out to add much needed land for development. It cannot be denied, however, that the best use of the lake has not been made for ornamental or utilitarian purposes. 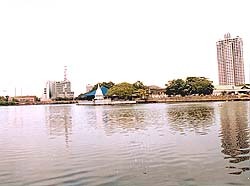 The Beira Lake is one of the principal features of the city of Colombo, and it has received the attention of the Portuguese, the Dutch and the British in the past. One of the earliest references to the lake is found in The Conquest of Ceylon by Father Fernando de Queyroz published in 1688. He says that when Vijaya Bahu laid siege to Colombo in 1521, the Portuguese Captain Lopo de Brito pursued the attackers, "killing and wounding them till they reached a brook, which was afterwards damned into a lake for the better fortification of the City." Queyroz adds that, when large reinforcements arrived from Goa in 1555, they "built some houses giving rise to the city of Colombo which had within it the mound of Laurence and was surrounded by Capana (in Sinhala Kalapuwa), a lake nearly three leagues and a half in length, which in summer admits of access to Colombo in some places with water to the waist." During the siege of 1578, Mayadunne, seeing that the Portuguese boats were plying in the lake, "determined to drain it, but without avail, as it was valourously defended." His son Rajasinha besieged Colombo several times and drained the lake dry twice by having canals, one of which is now represented by the San Sebastian Canal. The lake is described as full of crocodiles, hence the name Kaymans Gate. The word Cayman is a crocodile in the languages of both the Portuguese and the Dutch. There were several islands in it, most of which have since disappeared. Slave Island had a cinnamon plantation and another island was large enough to have 600 coconut trees and a whole village. In preparing the defences of Colombo against the Dutch attack in 1665, the Portuguese "made use of the lake, by which they brought palm tree timber, and fascines, and a certain bark of a tree which they call vedipara, which made up for the lack of matches". The Dutch in their turn, "launched on the lake many light and capacious vessels of extraordinary workmanship in which were 250 soldiers, to capture the house of D. Jeronimo de Azevedo, where the wall of the rampart was three palms broad and little more than one fathom high". The lake was the scene of some of the bitterest encounters between the Dutch and the Portuguese. The Portuguese ramparts which were battered into rubble were temporarily replaced by a stockage extending to the edge of the lake. Later the defences were withdrawn to a higher ground a couple of hundred yards back. The low-lying ground outside the flooded and a broad expanse of lake flowed in as far as Kaymans Gate. The offensive smell experienced by motorists and pedestrians as they pass the Beira Lake, is that of hydrogen sulphide and other gases containing amino released from petrifying dead algae varieties lying unflushed at the lake bottom. Scientists at the Central Environmental Authority believe that these algae varieties are lying unflushed at the lake bottom. They state that these algae varieties thrive and multiply profusely on nitrates and phosphates contained in human excreta and urine. Low-income city dwellers along the edge of the Beira Lake are defecting directly into this lake and offering a rich nutrient medium for these algae to thrive, the scientists add. They say a multi-million rupee project was underway under the Urban Development Authority (UDA) to develop the Beira Lake.